APSDS can be readily used to design heavy duty industrial pavements such as container terminals. Container handling vehicles can have tyre loads comparable to those resulting from very large aircraft. 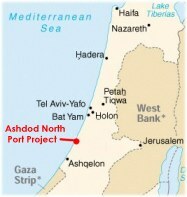 The development of the new Ashdod North Port in Israel will involve an investment of about a billion dollars. The Port of Ashdod is situated about 40 kilometers south of Tel Aviv. Pavement design has been carried out by Kars Drenth of Netherlands Pavement Consultants (contact details below) on behalf of ARCADIS Bouw/Infra Consultants. Engineering analysis of the pavement design of this container port addressed Bulk and Cargo Handling, General Cargo and Ro-Ro Activities and Container Handling. The pavements are loaded by Front Lift Trucks, Ro-Ro Trailers, Rubber Tired Gantry Cranes and In-Terminal Trailers. APSDS was used to study pavement alternatives based on a paver block or asphaltic surfacing and cement bound base layers, including the lateral wander of the various vehicles, the frequency distribution of container weights and loading groups of the traffic spectrum. APSDS has recently been used on container handling projects for the Port of Brisbane Corporation (Australia) and CTX Corporation (Florida).